HIGH RIVER, Alta. 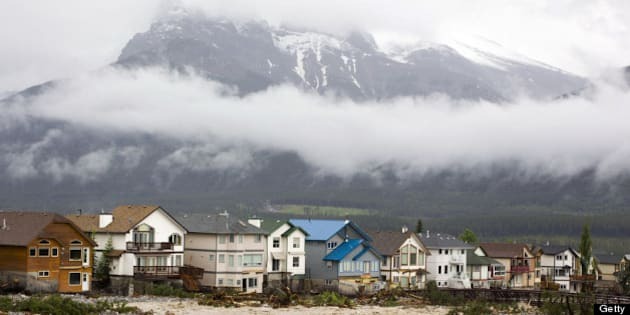 - A new Alberta flood plan will encourage people to move away from zones prone to high water and will set better protection standards for areas less at risk, says the leader of the province's disaster task force. Municipal Affairs Minister Doug Griffiths says it doesn't make sense for people to rebuild in areas hit by damaging floods every few years and have the government pick up the extensive cost of repairs. "We can't — when we are responsible for taxpayers' dollars — allow people to be in spots that continually flood," he said in an interview Friday. "If their home or business has been destroyed, this is the opportunity to say that you are not building there again. Build somewhere else." Griffiths said details of the province's strategy are still being worked on and will be rolled out in the next few days. The minister suggested the plan will include a measure to not cover damage costs in extreme floodways in future if people choose to rebuild there. There could be incentives for people to leave high flood-risk zones. And legislation already on the books that restricts the building of subdivisions in floodways needs to be strengthened and enforced, he added. "Even though right now, in law, it says you can't build in a floodway, we have some municipalities that have built subdivisions in floodways. We don't monitor. We don't check that. But maybe it is time that we did monitor and check that," Griffiths said. "We don't want to remove autonomy of municipalities, but maybe we need stronger wording in legislation that says, 'Thou shalt not build where the water flows.'" The town of High River was hit hardest by extreme flooding in southern Alberta last month that destroyed or damaged many homes and businesses in the community of 13,000. The city of Calgary also suffered extensive damage. The region was hit by serious but less destructive floods in 2005. A government report completed the next year recommended that development on flood plains be restricted. It also suggested that buildings in high-risk flood zones not be eligible for disaster recovery payments. The province didn't act on the recommendations. The Alberta government has already released an initial $1 billion to deal with the most recent flood disaster, but the final cost is expected to be much higher. Griffiths said the focus will be on better mitigation for communities and areas where extreme flooding is less of a risk. The policy will spell out that municipalities in "flood fringe" zones will have to work toward protecting themselves to a standard called a one-in-100 event, a term that means there is a one per cent chance of a flood happening in any given year. It will be up to communities to decide how to meet this standard, with help from the province and some federal government funding. "In some circumstances, it might be best to build a dike or a berm. In some other circumstances, it might be better to build a spillway or something that controls the water. In other circumstances, it may be better to raise the houses up or build them up on higher plains of dirt," Griffiths said. "Every circumstance is going to be unique. We won't spell out what to do. It will state you must meet these new standards and criteria, and then allow flexibility community by community." High River resident Floyd Langenhoff said it would be a mistake not to allow people to rebuild in flood-prone areas. He suggested it might be better to restrict new development than to bring in rules for people who have lived in an area for a long time. "A lot of these buildings, these towns, were started a hundred or more years ago," he said as he continued the process of cleaning up the mess caused by the flood that hit three weeks ago. "That is a very hard thing to fix. I would say no new development in flood plains." The province lifted the state of emergency in the town Friday. Griffiths said the flood plan will be a starting point and will be amended and fine-tuned over time to make it as effective as possible. He said problems posed by the flood disaster are complex and there are no quick, easy, one-size-fits-all solutions. The government wants to move as quickly as it can to give those affected the information they need to get on with their lives. "We have some people who are saying, 'I don't know whether I should repair or rebuild.'" he said. "They want to know what the new policy is going to look like. "It is only fair to get them that information before they start work."